I love taking photos and sometimes go a bit crazy, snapping this and that. When I get home and look at them on the computer I may wonder why I took so many. Other times I am so glad I did. Sometimes street art is spoilt by graffiti. This annoys me, especially if the original would have made an excellent image for an article. I am most annoyed when someone has written something crude on a piece of art. 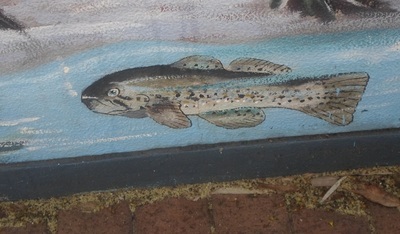 At other times a new piece of art is painted over the top. Even if the new piece is great, it's nice to have a photo of the original work. One day, some months ago, I got off the train at the Salisbury station as I do quite often. There are a number of pieces of street art there, mostly paintings but also some colourful mosaics. As I headed to the shops I realised one wall of art had been repainted with grey paint. I hoped new art would soon appear but that hasn't happened. Maybe one day. 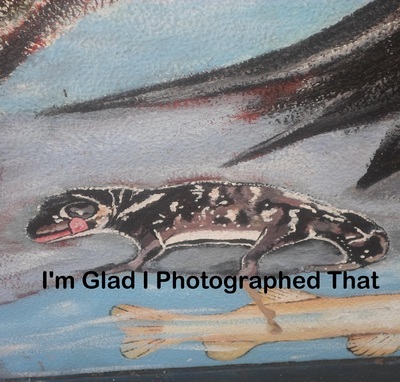 I was so pleased I had taken photos of the creatures that had adorned the wall. Although these paintings are now gone, I have a permanent record of them thanks to my habit of taking lots of photographs.